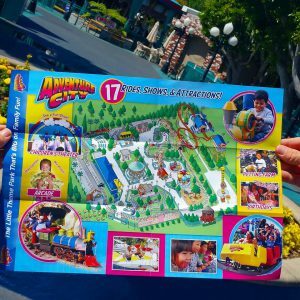 If you are a family with small children, then Adventure City, just outside of Anaheim, California is for you. This is a great place for kids to ride, explore and have fun. The park is just over 2 acres and slogan I is “ The Little Theme park that’s BIG on family fun.” The park features 17 rides which includes two roller coasters. Kids can take a ride on the Adventure City Express Train or get wacky on the crazy bus. There is also a Ferris Wheel, a balloon ride and a vintage carousel ride. An all time favorite among the tikes is the Emergency Car Ride. The kids play dress-up as they don policeman or firefighter gear and drive their parents around the ride. A dispatch soundtrack provides the kids with several ‘emergencies’ to respond to. Along with the several rides, both the kids and parents can relax and enjoy a puppet show, magic show or build a train in the Thomas the Tank Engine Area. If that isn’t enough, they can get their game on in the arcade or climb a rock wall. As Adventure City is specifically geared toward young children, it also includes a petting zoo in which children can see rabbits, sheep and other animals. Enjoy your meal in the picnic area where families are allowed to bring their own food or can eat at the s concessions throughout the park. Admission includes unlimited use of all rides, shows and attractions except the climbing wall and arcade. Adventure City generally updates this page throughout the year, so check back to see if new specials and coupons have come in. Note to our visitors: Coupons and specials at Adventure City can change without notice. So please visit their official website to make sure of the latest pricing and coupons.